What was for decades the Reading, Massachusetts town landfill is now a 33.5-acre, $90 million family lifestyle retail center known as The Crossing at Walkers Brook. 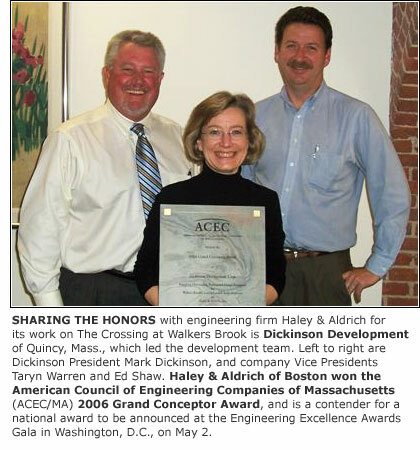 Boston engineering firm Haley & Aldrich has received the top engineering award in the state -- the American Council of Engineering Companies of Massachusetts (ACEC/MA) 2006 Grand Conceptor Award for unprecedented engineering applications in the redevelopment of the former landfill. Top national awards will be announced at the Engineering Excellence Awards Gala in Washington , D.C. , on May 2. Because of its complexity, the Walkers Brook project took the team led by Mark Dickinson and his Dickinson Development Corp. of Quincy nearly seven years to complete. Between 1997 and 2004, the team overcame significant environmental, technical and political obstacles to bring the idea from dream to reality. Today, the 475,000 square foot center is home to anchor retailers Home Depot and Jordan 's Furniture and nine other blue-ribbon retail and restaurant operators. �This project dramatically demonstrates that former landfills can be converted from a public liability to a significant commercial and community asset,� commented Steve Kraemer, Project Officer-in-Charge and a Senior Vice President of Haley & Aldrich. Because the site is surrounded on three sides by wetlands and Walkers Brook, Dickinson 's team faced a host of unique and complex engineering and architectural challenges that also had to meet requirements of the Mass. Department of Environmental Protection. During the three-year construction period, a unique public-private partnership helped keep the project on time and on schedule, overseen by Dickinson Vice Presidents Ed Shaw and Taryn Warren . About 1,000 construction jobs were created. Today, the on-site businesses provide some 1,000 full and part-time jobs and bring annual property taxes to the Town of Reading. In addition, each year the Commonwealth of Massachusetts receives millions of dollars in sales and income tax revenue. Of special note, in keeping with Dickinson 's vision for the site, the team was able to bring back some of the rustic beauty that had been lost to the landfill. Walkers Brook, was also cleaned up and improved. The Town Manager noted that the plaza has benefited the town in many ways. It has been acknowledged that the success of the project is due in large part to the vision and hard work of stakeholders, including Town officials , local residents, MassHighway , the DEP , and tenants. �I commend the team's high level of professionalism, integrity, cooperative spirit and perseverance that contributed to the project's ultimate success,� Mark Dickinson said. Besides Haley & Aldrich, Dickinson 's development team also consisted of: project partner Pinnacle Partners; construction consultants Pinncon, Inc. and general contractor Suffolk Construction; architect Carter-Burgess; and additional engineering firms VHB, Inc., and Dufresne-Henry. Morris & Morse Co, Inc., of Boston served as financial advisor to Dickinson. Leasing was handled by The Wilder Companies. Founded in 1980, Dickinson Development Corporation has developed over three million square feet of office, retail and industrial space and hotels in New England and Florida. The company is seeking similar development opportunities in southern New England . (For more information, contact Ed Shaw or Mark Dickinson: 617-770-1955 or visit www.dickinsondev.com).